Sometimes a slight twist, like a special bread or an unexpected cheese, makes an ordinary sandwich suddenly appealing. 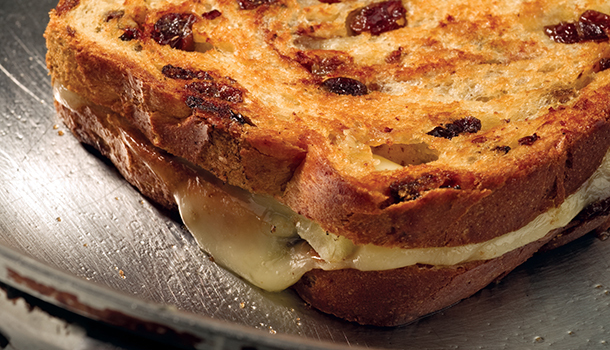 In this heated sandwich, Brie, a creamy, soft cheese, melts into a yummy puddle of comfort on raisin bread. You can substitute Cheddar or another hard cheese for Brie if your doctor has advised you to avoid soft cheeses. Spread the Brie on one side of each piece of bread. Place apple on top of one slice and top with the other slice, cheese side down. Spread the butter on the other sides of the bread. Place in a skillet over medium heat. Cook until the bottom is golden and the cheese begins to melt. Carefully turn the sandwich and cook until golden and the cheese has melted completely.